00:55 when the orchestral hit comes. 01.50 when Oh Yeah is heard just before the main melody comes on. 02.45 after the second Oh Yeah and when the hypnotic bassline starts. 04:38 when the breakdown starts and starts to fade. 05:06 when its all quiet except for the lead instrument. 06:01 after the orchestral explosion and the drums start playing again. B.B.E. were french producer Emmanuel Top together with italian producers Bruno Sanchioni and Bruno Quartier. Emmanuel Top had done some acid-influented techno before the project and Bruno Sanchioni had quite some fame with various projects like Age Of Love which should be pretty well-known to you guys. Bruno Quartier had also done quite a bunch of various tracks under quite a few aliases. The name B.B.E. comes from the first letters of their names. 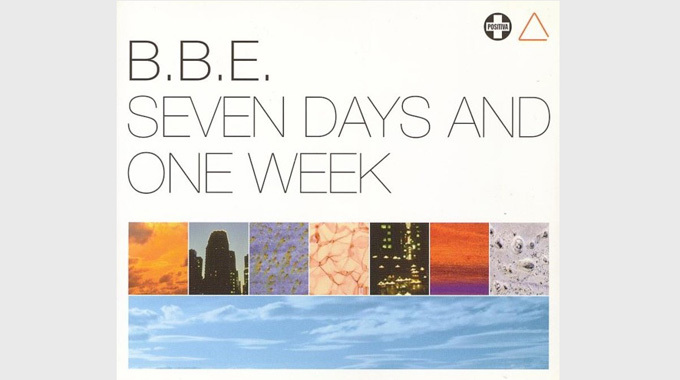 B.B.E.’s first track was actually Seven Days And One Week. First released as an EP called Seven Days And One Week / Hypnose and later released as an own single with various remixes. Over the years, the track has been released on various labels like Positiva, Urban, EMI and Armada Digital just to name a few. When it comes to remixes, i’d say that I still prefer the original club mix which still sounds pretty fresh even today. A top tip: Listen to Hypnose, a really dark and hypnotizing track which reminds you of Eric Prydz alias Pryda. The follow up to Seven Days was the amazing single Flash. Although released in late 1996, the major breakthough came in 1997 when it made it’s way into the UK top 10. Worth noticing is that on a few versions, the track Photo (which is a personal favourite) appears. The track was later re-released as Enter – Load & Save. Also worth noticing that a few versions of Flash also contained the Rollo & Sister Bliss remix of Seven Days And One Week. As I mentioned above, the track Photo was re-released as Enter – Load And Save. What they tried to do is to take the dark Photo and make it more ”fluffy”, more atmospheric. What I really liked about Photo was that it was bang on dark and moody. The fourth single, Desire was another chart-topper and made it’s way into the top 20 in Ireland and the UK. The Age Of Club-mix is worth a listening. Deeper Love from 1998 was the first vocal track so far. The vocalist used was Joy Rose from the british house-collective Incognito. The track became another top 20 track in the UK. Worth noticing is that on the album, the track is called Symphonic Paradise so the single is sometimes called Deeper Love (Symphonic Paradise). This was also the year that B.B.E. released their debut album, Games, a 13-track monster which had all the tracks to date and a few more. The album did decent chart-wise and made it into the top 60 in the UK. I still got my album somewhere but haven’t really listened to it in quite some time. After the albumrelease, the guys took some time off. They tried to restart the project after Emmanuel had finished his new studio in 2001 and even released 3 more singles which never made it into the charts. The 2001 track, B.B.E. Vs Emmanuel Top – Orion was the first track. It isn’t bad at all. More trance-sounding than previous track which probably was a sign of the times when it was released. The second track, Free, follows in the footsteps of Orion. I love the pumping bassline though. The last track, Hollywood was more house than trance but still kept that simple bassline that many tranceartists at the time used. So how to sum this up? For me personally, B.B.E. were a big part of my listening back in 1996 when Seven Days first came out. I was all into the dream trance-sound that came with Robert Miles – Children in 1995 which I really loved. The first 2 singles, Seven Days and Flash (and Photo) was easily in my top 10 tracks of 1996 as they represented a fresh new sound. I honestly can’t say that the tracks that followed was in the same league, not even by a long shot. I did love the album though which sounded really fresh for 1998. The thing with classics like this is that they will always live on as long as people keep playing them. It’s really awesome to hear the classics, especially played by your favourite DJ. I know that I will keep on playing them for quite some time as I concider them true classics.